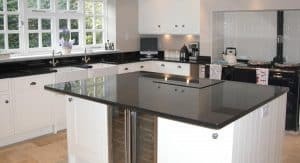 Whether you’re updating a traditional style kitchen in Deal or considering a total refit with contemporary style cabinets in Margate, opting for quartz worktops in Kent is the showstopping choice when it comes to updating your kitchen. A clever combination of natural quartz and polymer resins, this beautiful material is a premium solution for its durability and natural scratch resistance. Not only does quartz look beautiful, it’s also incredibly practical. Easy to look after yet very difficult to damage, a quartz worktop is virtually indestructible. Unlike other natural stone worktops, it doesn’t need sealing and resealing but will stay looking good with a simple wipe over with a damp cloth. Non-porous and heat resistant – though you will need to use a heat pad for best results – it’s a natural choice for any kitchen when you want to update your worktops with added functionality and style. High-end kitchens have always used natural stone worktops. As kitchen design evolves and innovates, quartz has emerged as a highly desirable material thanks to its ability to deliver cutting-edge design to any kitchen. While some worktops are created from quarried stone slabs, the new quartz worktops are created from a stone/polymer mix that combines the beauty of natural materials with additional sustainability and durability. And because quartz is the second most abundant mineral on earth, your new worktops will have a low environmental impact. Opt for Silestone for an environmentally friendly choice. When you want to create the wow factor in your kitchen, quartz is truly unbeatable. As a man-made material, it has a consistency of colour and pattern designed specifically to please the human eye. Your chosen pattern will always be fault free and the richness of colour will never disappoint. It’s the ideal worktop material when you want to restyle a drab kitchen with showstopping style. At Palazzo Stone, we have the expertise you need and the prices you’ll love to make an artisan stone worktop a reality in your kitchen. Get an instant quote today for our most popular colours or contact us to discuss a bespoke quartz worktop that will give your kitchen a face-lift.